Yellowfin operates out of four major regions. In Australia we have our head office in Melbourne and a sales office in Sydney, and we also have sales offices in the UK, North America, and Japan. When we opened our Japanese office nearly three years ago we knew that we had to take a different approach. Perhaps that’s because everyone told us that doing business in Japan is very different from operating in Australia, the US, or Europe. We approached the Japanese market knowing it was going to be challenging. Obviously it’s culturally very different from Australia. This difference extends to the sales culture and even how organizations interact with each other. So we steeled ourselves by learning about the culture and absorbing as much information about doing business in Japan as we could. We asked questions to help us understand how things operate there. As a result we were far more proficient in understanding the dynamics of the Japanese market than other markets we’ve entered. In markets like the US, we probably made the early assumption they would be similar to Australia. In fact, there are many underlying differences in new markets no matter how similar they look on the surface. It’s very easy to get caught out by those. Japan is a significant market for business intelligence and analytics. When we started thinking about basing our Asian sales operations in Japan we already had a solid base, we’d partnered with a good distributor and had about 100 customers. We could see the potential in the market, but when we spoke to our distributor about investing more they were reluctant, so we offered to take on their team. I’ve seen many companies that enter Japan try to take their existing model and force it into the Japanese market. This often results in a level of passive-aggressive behavior from employees and the organizations that they’re trying to sell to. We took a fundamentally different approach. We wanted to behave like a Japanese company. This involved understanding the nuances of the language of business in Japan. People may be saying yes but they really mean no, and that’s an important thing to be aware of. If you don’t understand this then you’ll never be successful in Japan. So we had to make sure that we had the right people on board. People who are invested in the business and see themselves as being part of its growth. But most importantly people who are Japanese and know the market. That’s why we’re extremely lucky to have Yugo Hayashi. While many western businesses bring in someone to run their Japanese arm, I think hiring someone from the local market was the right decision. It ensured that our business was essentially Japanese because Yugo understands the culture and how to run a Japanese team. Growing and managing a team is difficult anywhere in the world, but in Japan being culturally sensitive is crucial. There are many key differences about doing business in Japan, but you can challenge some of them if it makes a real difference to your business or employees. Take the traditional business attire. Every man in Japan wears a dark suit and white shirt. 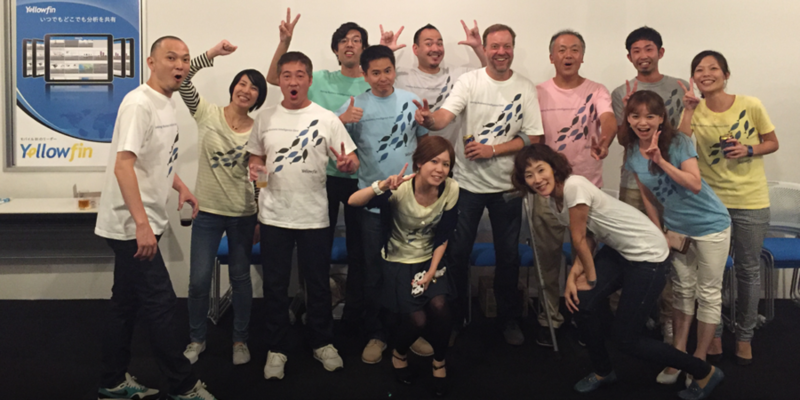 At Yellowfin we have a casual dress code, which was a real challenge for our Japanese team. They believed it would impact how their customers perceived them. Rather than rejecting the idea outright, we suggested they talk to their customers and find out what they think. The result was surprising. It turns out that a casual dress code didn’t really make a difference, only one customer pushed back and said they wanted to see our salespeople in a suit. Our dress code has actually helped to differentiate our business in a positive way. Our customers envy our business model and many have even expressed that they’d like their business to be more like Yellowfin. The other cultural norm we challenged is taking leave. Most employees in Japan don’t take leave even though they’ve earned it. So we instituted a policy that requires everyone to take their leave (at risk of a call from a suitably cranky global CEO). This has changed the way the team interacts. Because everyone takes their leave, everyone supports each other when they’re on leave. This was a huge cultural shift for the Japanese office, but we felt it was important. I now ask more questions before considering international expansion. I consider how regions behave differently and am more open to understanding how we need to adapt to be part of the market. It’s really about valuing diversity and allowing each business area to have the autonomy they need. We generally have an autonomous model where our sales regions can do what they think makes the most sense for their market. So if there are certain cultural norms about doing business, we’re not going to break those. We want our business to be part of those norms because that’s how we will be successful. First, you have to understand the culture and be sensitive to it. You can’t push your own business model as it won’t be well received. Second, is to shape your own business by chipping away at the cultural norms rather than going in with a sledgehammer. You can really build a great reputation for your business and improve the experience of your employees. Finally, embrace the diversity and allow your local business to create an environment that is uniquely their own. This may mean the business doesn’t operate the same as other regions, but that doesn’t mean it’s wrong. It’s just different.